We planted more zucchini plants than necessary this year. 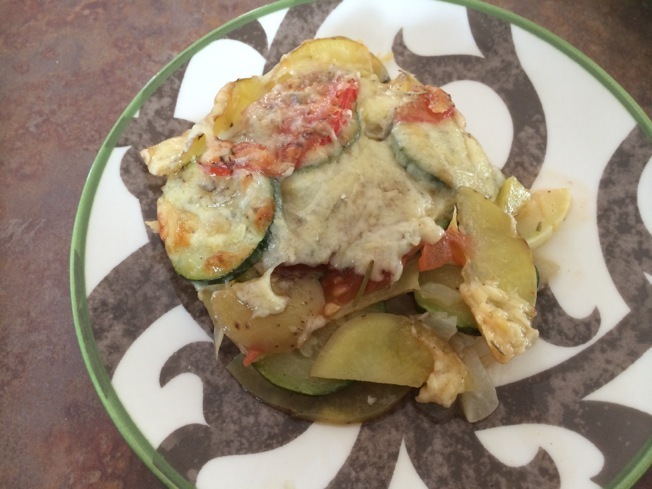 So, get ready for lots of zucchini recipes this summer! We pulled one of the vine today that was hidden under a leaf. I think it weighs at least 3 pounds. It is massive! This comes from Delicious Recipes.com. The prep for this dish takes some time- there is a lot of slicing, and you need to slice everything REALLY thin. Especially the potatoes. Arranging them in the dish was sort of fun. It reminded me of the scene from the Pixar movie Rattatouille, when Remy makes the amazing pan of Rattatouille that impresses the food critic. Lots of layers of thin veggies. Pretty! This was pretty good. I am not sure I’ll make it again, however. Last year I posted my Potatoe Tomato Pie that is a similar dish, and I think the flavors were better, and I loved that hash brown crust. However, this was a nice healthy little meal, if you’re up for all the work! Preheat oven to 400°. Dice onion and mince garlic. Sautee onions in a skillet with olive oil until softened, about 5 minutes. Add garlic and cook another 2 minutes. While the onion and garlic are sautéing, thinly slice the rest of the vegetables. Slice them into the same shape. You can use a mandolin, a food processor, or by hand, just try to cut them into the same thickness. Spray the inside of an 8×8 square baking dish with non-stick spray. Spread the softened onion and garlic in the bottom of the dish. 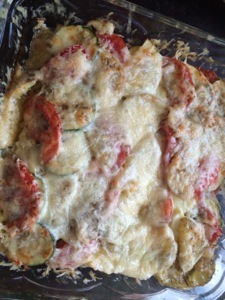 Place the thinly sliced vegetables in the baking dish vertically, in an alternating pattern. Sprinkle generously with salt, pepper, thyme and rosemary. Have to make this dish this summer.